High School Kicker bombs kickoffs out of the end zone and kicks 60 yard field goals. Jesse Sandoval, standout kicker from Valencia H.S. in Placentia, CA kicks 40-60 yard Field Goals in a private kicking lesson on 8-24-09 with Coach Brent from www.kickingworld.com Jesse is a talented young man with a good head on his shoulders and should be playing college football next year. Kicks in this video are 43, 45, 50, 55, 60 yard field goals. He bombs the ball deep in the endzone (minus 8 to out of the end zone) on kickoffs and can consistently nail 50 yard field goals or better with the leg to make even 60 yarders! 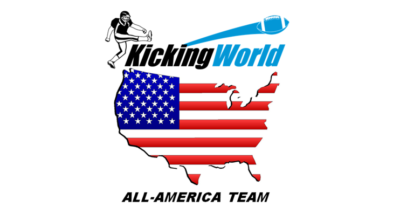 Coaches, Scouts, Recruiters: Please call Brent at 512-817-1333 for more kicking footage or for a personal reference of Jesse Sandoval.